Are you looking for a fun activity to keep your children busy during the Christmas hustle and bustle, then I want to remind you about a great download from Multicultural Kid Blogs! 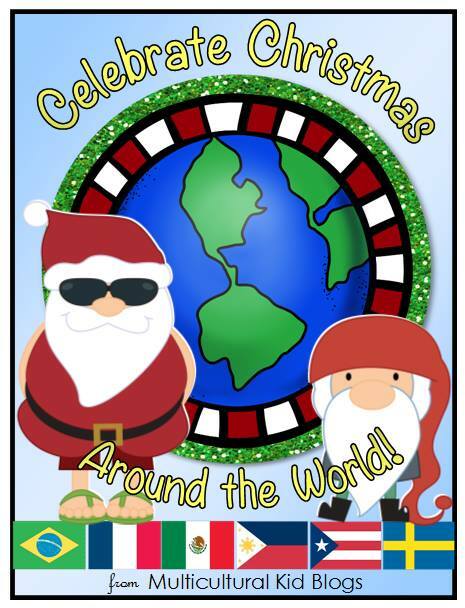 A few years ago, I joined forces with some wonderful ladies (Judith from Little Bilingues and Julie from Open Wide the World) to create the Celebrate Christmas Around the World packet for MKB. It remains one of my favorite projects because it has so many great activities inside it. I had so much fun working on the Mexico and Puerto Rico sections. This fun and educational packet features the Christmas traditions and celebrations of six countries: Brazil, France, Mexico, the Philippines, Puerto Rico, and Sweden. The cover page features the country’s flag & a Christmas greeting in the language of the country. a Page of Country Facts This page includes the country’s official and common name, its location circled on a world map, capital city, location, population, official language(s), and an interesting fact. 2 Pages on Christmas CelebrationsThese two pages share the important and traditional celebrations of the country, and include cute graphics for students to color. a Christmas ActivityThe activities range from a word search to a DIY board game! a Special Holiday RecipeMake and taste a traditional holiday recipe from each country. After completing the packet, students will have the opportunity to show what they have learned by answering 12 comprehension questions, two for each country. We hope you and your students enjoy this peek into Christmas celebrations around the world! You can purchase and download your packet on the MKB website or in their TpT store.